Using a notebook PC has often meant making do with less on the road and at home. But with new options available for notebooks, road warriors can take it all with them. 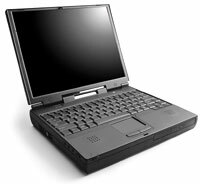 Gateway's Solo 9300cx has a 600-MHz Pentium III processor, a 12G hard drive, 15.7-inch SXGA display and up to 256M of RAM. It's priced at $3,699. Power and performance come at a price, though, so make sure you're getting no more and no less than you need. For occasional word processing, spreadsheet and e-mail chores, consider a low-cost $1,000 notebook with the right amount of power and memory. If you can part with $1,500 to $2,500, there are plenty of highly portable, thin and light or ultralight notebooks with enough upgrade options to make the most discerning road warrior happy. But if you are seeking the creme de la creme of notebook computing'that is, a mobile machine with enough power, memory and connectivity options to serve as a complete replacement for a desktop PC'consider one of the high-powered portables listed in this guide. On the outside they look similar. But it's what's inside that counts. All the notebooks listed are just as fast or faster than most office PCs, but they cost twice as much. Expect to pay at least $2,500 and probably closer to $3,500 for the one that will make you happiest. Intel Mobile Pentium III processors running at 450-MHz to 650-MHz speeds power all the systems listed, with the exception of the Apple PowerBook's 500-MHz Power PC G3 processor. All provide expandable RAM ranging from a low of 32M on the system's motherboard to 256M in most cases. Many of today's high-end office and multimedia applications need a minimum of 64M, preferably 128M or more. A 14.1-inch or larger active-matrix LCD with XGA resolutions of 1,024 by 768 should be considered minimum for notebooks in this category; buy a larger one if you can afford it and if it is available from the manufacturer. Some manufacturers continue to offer 6.5G hard drives as standard. I strongly recommend upgrading to a 12G or even 18G for a system that will stand in for a desktop PC. Most, but not all, high-end notebooks are built around three-spindle designs so there's room for a built-in hard drive, 1.44M floppy drive, and a 24X CD-ROM or 4X/6X DVD-ROM drive. In any case, look for one with at least one modular bay that will let you swap out a variety of modules including a CD-RW drive, or a Zip100 or LS-120 removable drive for extra data storage. And virtually all high-end notebooks offer one or two Universal Serial Bus ports for plugging in extra storage drives or peripherals as you need them. 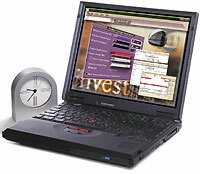 IBM's ThinkPad 600X comes with a 650-MHz Pentium III processor, 64M of RAM, a 12G hard drive, 13.3-inch XGA display and a 24x CD-ROM drive. It's priced at $3,799. Any notebook you select from this list will almost certainly be equipped with one high-speed bidirectional parallel, serial, PS/2 and IrDA port and two CardBus PC Card slots. Relatively few notebooks offer high-speed IEEE-1394 FireWire ports, though more will come with this feature by year's end. Look for a built-in 56-Kbps V.90 modem and an optional 10/100-Mbps Ethernet card to connect the notebook to your office LAN. slightly larger and heftier than the thin and light models that are becoming more common. They weigh six or seven pounds or more depending on the options selected. The slightly larger size helps them accommodate the extra drives users want, as well as room for full-sized keyboards. Virtually all the units listed are optimized for multimedia performance, meaning they have at least 4M and often 8M of synchronous graphics RAM on their video cards, along with sound cards, built-in speakers and microphone jacks. Most notebooks now come standard with Microsoft Windows 98 and optional applications software; expect more to come bundled with Windows 2000 as it gains popularity in the desktop PC marketplace. Processors. More than any other single factor, Intel's new class of Mobile Pentium III processors accounts for the ability of notebooks to compete with desktop PCs. They now run at speeds between 450 MHz and 650 MHz and are due soon to increase to 700 MHz. Mobile Pentium IIIs are built around 0.18-micron technology'the preceding Mobile Pentium II technology was 0.25-micron'which lets them run faster and cooler because it cuts the distance information travels over tightly packed circuits on the chip sets. Apple's PowerBook comes with a 500-MHz Power PC G3 processor and 128M to 512M of RAM. It's priced at $3,499. The Pentium III CPU line incorporates 256K of Level 2 cache, a high-speed buffer memory system that holds information close to the processor to speed processing activities. Notebooks with Mobile Pentium III processors are also built around 100-MHz system buses, which are speedier than earlier 66-MHz buses. The new processor line also includes Streaming Single Instruction Multiple Data extensions, an improvement over the older MMX technology, to increase the speed of multimedia applications. Power management is an especially important factor for notebooks, and Pentium III machines don't lag in this arena either. Notebooks with 600-MHz and 650-MHz Mobile Pentium III processors incorporate SpeedStep, a technology that steps the processor down from 600- and 650-MHz speeds to 500 MHz to save electricity and battery power. All Mobile Pentium IIIs incorporate QuickStart, a management process that decreases the power supplied to the processor if a user stops working for 10 or 15 minutes. Memory. Adding memory to notebooks used to be a task reserved for technology gurus. With most notebooks today, it's almost as easy as adding memory chips to the dual in-line memory module slots in a desktop PC. If your notebook comes standard with 64M of RAM, buy more memory in 64M or 128M modules, open the tiny door somewhere near the base of the unit and pop in the expansion card. Voila! You've got enough synchronous dynamic RAM to make your notebook competitive with a deskside or desktop PC. Hard drives. Hard drives in notebooks are built around Direct memory Access, Ultra ATA/33 or Ultra ATA/66 technologies. Ultra ATA/33 drives communicate with the system motherboard. The 33-Mbps and Ultra/66 drives communicate at a faster rate of 66 MHz. Keep in mind that both the drive and the motherboard must operate at the same maximum speed to take full advantage of the drive's speed. As for capacity, a 12G or 18G hard drive is sufficient for most purposes. Display. 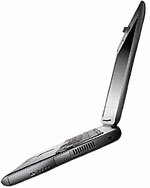 No notebook should be considered high-end unless it comes with an active-matrix LCD screen of at least 14.1 inches. Many new notebooks now come with 15.1-inch and even 15.4-inch screens. If you attach an external 17-inch or 19-inch CRT monitor to your notebook running Win98, the OS' Dual Monitor mode will allow you to view both screens simultaneously. 'Buy an expensive notebook PC only if you're sure you'll use it frequently. Notebooks are nice, but they're not for everybody. 'Buy a notebook that has the fastest processor you can afford, but don't neglect other important components, such as RAM, drive size, display size and port connections. 'Take note of a model's maximum allowable RAM. 'Choose a 14.1-inch or larger active-matrix LCD. 'Look for DVD-ROM technology, which offers greater flexibility than a CD-ROM drive. 'Invest in a port replicator or docking station if you plan to work on a project for hours at a time. Multimedia. Some notebooks perform multimedia tasks better than others. Make sure your notebook's video card supports at least 4M of video SGRAM; 8M is preferable for running applications requiring 24-bit colors. Don't expect much from any notebook's tiny built-in speakers; a port for earphones will provide decent stereophonic sounds for CD playbacks if the audio card supports stereo. Expansion. If you can, choose a model that can connect to a port replicator or docking station that will provide extra flexibility. You may want to include extra peripherals, drives, PC Cards or memory, or quickly hook your notebook up to a 17-inch monitor when you return to your home port after a trip. Navigation. Unlike ultralight notebooks, desktop-replacement notebooks shouldn't fudge on keyboard size. You can get a full-sized keyboard with most of them, although some of the function and numeric keys may be cramped. If you use your notebook for more than a few hours a day, plug an external keyboard into the PS/2 port so you can work more comfortably. Virtually all the notebooks listed come with either pointing sticks or touchpads. I detest using either except for the simplest tasks. If your notebook doesn't come with an optional port replicator or docking station and you already use the PS/2 port for a keyboard, use the USB port or even the serial port for a mouse. Ports. High-speed bidirectional parallel and serial ports are standard in virtually all notebooks, and you need them for hooking up legacy printers, scanners and other hardware. The use of USB technology, however, is increasing as an alternative for hooking up multiple peripherals to a system. The IEEE 1394 standard, is a promising development that offers very fast speeds'400 Mbps vs. 12 Mbps for USB'and could eclipse the use of parallel, serial, USB, PS/2 and game ports in future systems. But it won't catch on with most notebook vendors until peripheral manufacturers build around the IEEE 1394 specifications. Modems and LAN cards. High-end notebooks usually come with internal 56-Kbps V.90 modems. I find them attractive because they have been pre-installed by the manufacturer and don't take up available PC Card slots. I like controller-based modems best because their internal hardware circuitry removes extra loads from the system's processor. The 650-MHz Pentium III Sager NP8550 has 256M of RAM, an 18G hard drive and a 6x DVD-ROM drive. Less expensive internal host signal processing modems rely on the system's processor to handle data throughput, and in my experience this can slow maximum throughput to a 28.8-Mbps or slower crawl. Alternatively, there are plenty of good PC Card and PC Card combo'56-Kbps and 10/100-Mpbs Ethernet LAN cards. Optical drives. Most notebook vendors now offer either CD-ROM or DVD-ROM drives. Fast 24X CD-ROM drives are common and inexpensive, but can be used only for loading prestored programs and apps. 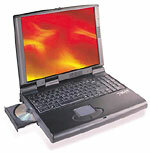 DVD-ROM technology offers more flexibility than CD-ROM, especially for multimedia applications. With a 4X or 6X DVD-ROM drive, you can play legacy CD-ROM disks, but you can also play movies; look for DVD-ROM with MPEG encoding to provide smoother and faster pictures. A more practical use for DVD technology is for high-end 3-D graphics applications. Although they are not as available as notebook options, CD-RW drives are also beginning to make their presence felt. With a CD-RW drive, you can use your notebook to read any available CD-ROM disk, or record and write data to its own disk. Power supplies. All notebooks come equipped with batteries and an alternative AC or 12-volt power source. The preferred battery type is lithium-ion, which provides the longest use and quickest recovery times. If your system offers a second battery pack as an option and you're willing to carry the extra weight, it's probably worth the money.